I’ve seen a number of articles floating around recently promoting a pretty negative view of makerspaces in libraries. While I understand that not everyone is going to be an evangelist maker librarian, I tend to think a lot of what lies behind these viewpoints is actually a mix of fear and misunderstanding. There seems to be a concern–perhaps in some cases founded on real-life observation–that makerspaces are set up to entirely replace libraries, or to force out the traditional services and purpose of libraries. It’s certainly possible that some take it too far. However, for a makerspace in a library to be truly successful and in the spirit of the movement, it should not and does not threaten the traditional library, but rather fits neatly into it. Libraries are informal learning spaces–a place where learning happens outside of the structured, more formal learning that takes place in a classroom. This is not a new concept at all, and it applies to all types of libraries: public, academic, K-12, special. Libraries have also been heavily involved in teaching literacies. The specific types of literacy addressed in libraries have grown over the years (i.e. from traditional to digital and visual–including transliteracy), but literacy on the whole has been important to libraries for quite a long time. In my view, makerspaces are a way of teaching creative literacy. Someone who is creatively literate is capable of taking something from the conceptual stage through the process of creation to result in a final product. Someone who is creatively literate knows what their options are to bring their idea to life, and isn’t afraid to explore and try out these options. A creatively literate person has confidence in their own creative abilities, and is aware of how to find more information and help to supplement their own knowledge. A person with well-developed creative literacy is a person who wants to contribute to the world rather than just consuming, and isn’t afraid to set out to do so. Libraries help patrons learn to read, to understand technology, to conduct effective research, and to work with multimedia; I know they can help patrons learn creative literacy, as well. Rather than threatening these other essential library services, makerspaces fit perfectly within this framework and this mission. What do you think? 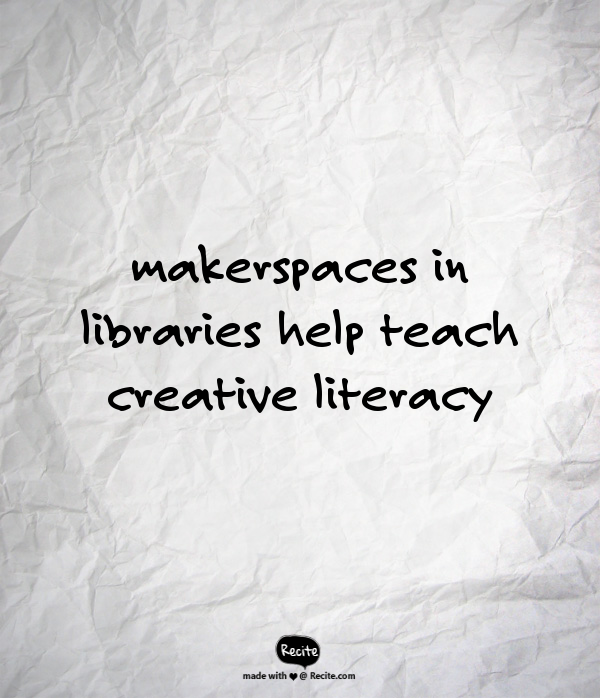 Have you faced pushback from others worried the makerspace is trying to tear down the traditional library? What are some reasons you think makerspaces make sense in libraries? Share your thoughts in the comments below or on Twitter! 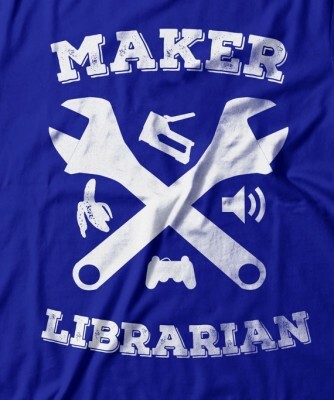 Image Credit: “Maker Librarian” by Kristi Taylor on Etsy — this is actually an amazing t-shirt you can buy, and I highly recommend it!